Google AMP – short for Accelerated Mobile Pages – is being readily adopted by websites and businesses around the world. If you’re not already using it you should. There are more than 125 million documents already indexed with AMP, so now is an ideal time to make the most of the service’s benefits. Google AMP is an open source project designed to get pages to load faster – often four times as much – on mobile platforms. Research shows that websites loading 1 second quicker can give them a 27% better conversion rate, so the speed really does matter. 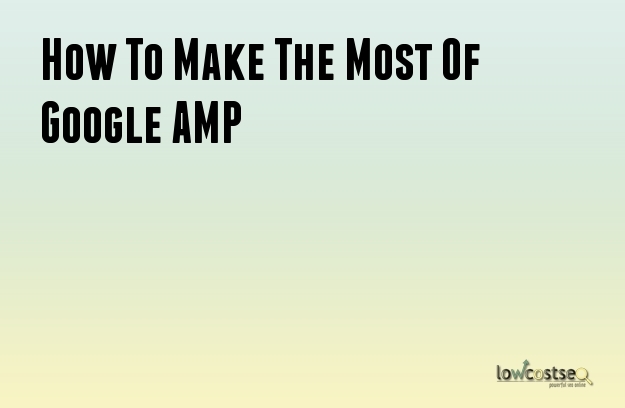 The most important factor with AMP is the conversion rate. A quicker loading time will get people to stay on the website. It doesn’t matter if its a blog post with links or a commercial shopping page – none of it will matter if people leave before the page is loaded. This makes AMP a priority for busy mobile pages, as these are often the slowest. However, there are some things to consider when it comes to the HTML. Great SEO services use the HTML to format the website for Googlebot to index correctly. This includes placing the right keywords in H1 and H2 tags where possible, as well as through the relevant anchor text within the main body of text. For now, AMP is indexed like normal websites, although the recent introduction of accordions and drop-down segments has many people worried. Google has, on a number of occasions, made it clear that drop-down or otherwise hidden content isn’t always seen when websites are indexed. As such, it is best to play it safe for now and not put all of your eggs in one basket. Ensure your main target keyword is in the title (H1) and subheadings (H2) that aren’t hidden through accordions. More and more people are using their mobile phone or other device on the go, so mobile websites are crucial. Google values mobile websites more and more, taking them into account ranking the overall URL. If your mobile site is basic, slow or unresponsive, your entire website will be ranked accordingly. Because it’s open source, AMP works well with any website. It’s HTML based, making it easy to integrated into existing code. There’s really no excuse for effective SEO packages to not incorporate the impact of AMP. It even works on Wordpress, thanks to a simple plug-in, so blog writing services can also make the most of it.